Alcohol abuse is highly disruptive of circadian rhythms, which refers to the timing of daily rhythms. 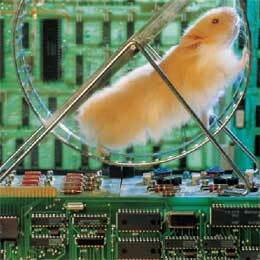 A new animal study has used hamsters to test for the influence of wheel-running on alcohol intake. Results indicate that exercise, perhaps through stimulation of brain reward pathways, may be able to reduce alcohol intake in humans. Alcohol abuse is highly disruptive of circadian rhythms, and circadian disruptions can also lead to alcohol abuse as well as relapse in abstinent alcoholics. Circadian timing in mammals is regulated by light as well as other influences such as food, social interactions, and exercise. A new study of the relationship between alcohol intake and wheel-running in hamsters has found that exercise may provide an effective alternative for reducing alcohol intake in humans. In other words, said Alan M. Rosenwasser, professor of psychology at the University of Maine, chronic alcohol abuse and circadian disruption become reciprocally destructive and result in negative effects on physical and emotional health. “It is therefore very interesting that access to running wheels or other forms of voluntary exercise in animal experiments has emerged as a powerful environmental factor influencing brain health, circadian rhythms, and emotional well-being,” he said. Glass and his colleagues tested for three things: the effects of wheel-running on chronic free-choice consumption of an alcohol (20% v/v) and water solution; the effects of alcohol consumption on wheel-running in alcohol-naïve hamsters; and the influence of constant light (LL) on both alcohol consumption and wheel-running behavior.